When helping patients regain strong, natural-looking teeth through the state-of-the-art power of dental implants, Dr. Lee and Dr. Oh want to ensure the best outcome possible. Because the implant is replacing the tooth’s natural root beneath the gum line, a surgical procedure will be necessary. The Neo Navi Guide is a state-of-the-art technology that will help us plan your treatment experience comprehensively and confidently. Please contact us today if you’re interested in learning more or scheduling a first appointment at Beverly Dental Center. 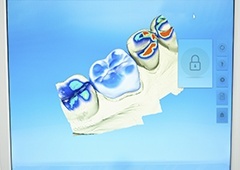 What is 3D-Guided Dental Implant Surgery? 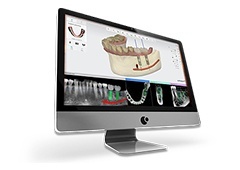 3D-guided dental implant surgery with Neo Navi Guide uses state-of-the-art 3D computer simulation to determine the ideal surgical plan for dental implants – no guesswork, no gaps of knowledge, and no unexpected surprises. Our dentists’ pinpoint accuracy results in a much more successful reconstructive experience for patients in need! Traditionally, it was necessary for dentists to open the gum tissue to place new dental implants, resulting in uncomfortable post-operative symptoms like oral bleeding and swelling. Thankfully, 3D-guided surgery eliminates this step of the process. 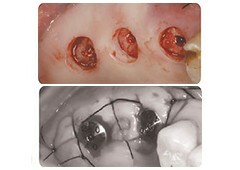 Because the gum tissue isn’t opened, patients also won’t require any sutures afterwards. Bleeding is often one of the most unpleasant post-operative results following surgical implant placement. However, because our patients receive no incisions and no opened gum flaps, they can expect any bleeding to be kept to a minimum. There may even be no bleeding at all to worry about! 3D-guided implant surgery allows Dr. Lee and Dr. Oh to plan ahead before any actual treatment takes place. Because of this approach, the length of your procedure decreases from around 50 minutes for one to two implants all the way down to 10-15 minutes. Patients will be spending much less time in the treatment chair during their implant procedure with the help of the Neo Navi Guide, and the lack of incisions and gum flap opening will lead to far less procedural discomfort and oral swelling. There’s no need for patients to wait for their oral tissue to gradually heal over time following the placement of their new dental implants. You’ll recover faster from the procedure and feel like your old self again in record time. First, the patient visits Beverly Dental Center for a full CT scan and impressions. Our dentists will take this diagnostic information and plan the surgery/surgical stent. The implants themselves, the surgical stent, and other components are fabricated and returned to our Carrollton practice. Surgery is performed safely and efficiently with guidance from the surgical stent. A temporary crown can be placed immediately following your surgical implant placement, which means you’ll leave our practice that very same day with a recompleted smile.